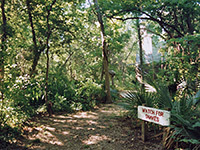 Palmetto is a minor state park in Gonzales County east of San Antonio, notable for its swamp and varied watery environments, more typical of lands to the east in Georgia and Florida. There are several short trails through different habitats, and the 41 site campground is a good place for an overnight stop for travellers on the main cross-country highway I-10, just 6 miles north. The approach to Palmetto State Park is south from junction 632 of I-10, along US 193 and CR 267 to Ottine. The slow moving San Marcos River flows through the park and several changes in direction over the years have left isolated lagoons and swampy areas in the dense surrounding woodland. Vegetation zones within the small area of the park include wet grasslands, woodland, swamp and sandy river banks, which together harbor over 500 different types of plant life. Many species are found at the limit of their extent, being more common further east or west. This area once had many hot springs and mud pools but these have all dried up in recent years as the water table has lowered. Lake Trail - a 0.6 mile route around the overgrown banks of Oxbow Lake, a truncated meander of the river. At dusk the path is enlivened by the bright orange and yellow lights of many fireflies. Other creatures that may be spotted are armadillo, deer and racoons. 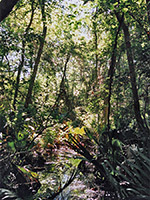 Palmetto Trail - 0.3 miles through a swamp filled with many of the tropical dwarf palmetto plants after which the park was named. There is also an old water conservation tower, one of several historic stone structures built by the Civilian Conservation Corps in the 1930s. A sign warns of snakes - venomous timber rattlesnakes may be encountered. River Trail - 0.6 miles along the San Marcos River and through adjoining woodland. There is a variety of trees including oak, pecan, elm, cottonwood and holly. Spanish moss, a distinctive plant of the southeast, hangs on many of the larger branches.